Puddings are soft and luscious treats, served in cups. Interestingly, puddings can even be savoury. But, in the dessert genre, puddings are usually rich and dairy-based with loads of cream and milk. 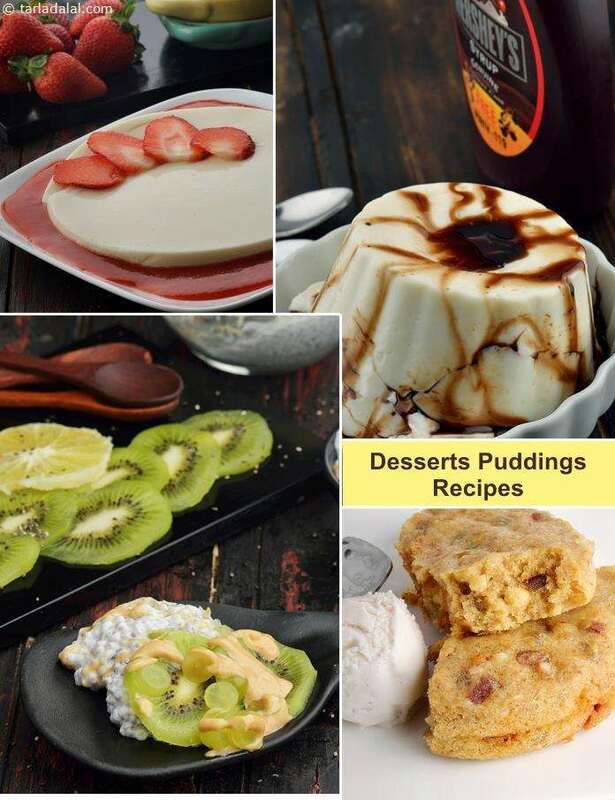 Here are some must-try delights like the Bread and Butter Pudding and the Quick Strawberry Delight is truly a quick-fix. a simple delicacy made with multiple layers of whipped cream, biscuits and strawberries. The sweet biscuits, strawberries and whipped cream combine to deliver a wonderful flavour and texture; satisfaction guaranteed in every mouthful. Tiramisu is a classic Italian dessert of coffee-coated biscuits layered with a luscious mixture of cream, often containing cheese and rum too. Here is a quick, non-alcoholic version of Tiramisu, which you can prepare in a jiffy when you sight a sudden guest, or when you are back from office but want to celebrate a happy occasion. A simple lunch-time pudding. Serve hot.